A passage in a recent essay at a Washington Post blog demonstrates just how insidious the notion is that the military made up the hero-warrior tale about Army private Jessica Lynch in the early days of the Iraq War. 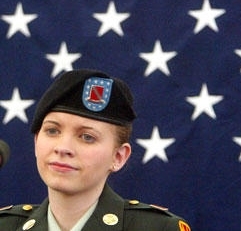 But it’s exceedingly the top in the case of Jessica Lynch: The claim that the military made up the tale of her battlefield heroics is seriously misstated. 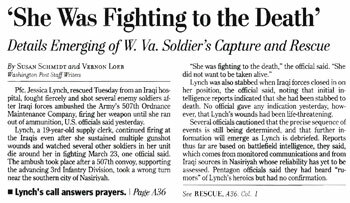 And more than faintly ironic, given that it was the Washington Post that reported Lynch had “gone down firing,” that she had fought ferociously in the ambush of her unit, the 507th Maintenance Company, in southern Iraq in March 2003. It was the Post — citing otherwise anonymous “U.S. officials” — that claimed Lynch had “shot several enemy soldiers” in the ambush. It was the Post that said Lynch “continued firing at the Iraqis even after she sustained multiple gunshot wounds and watched several other soldiers in her unit die around her” in the fighting. It was the Post — alone — that placed the story into the public domain. And none of it was true. Lynch was neither shot nor stabbed. She suffered shattering injuries in the crash of a Humvee as it attempted to flight the ambush. But she fired not a shot in the attack. Lynch was taken prisoner, but rescued nine days later from an Iraqi hospital by U.S. special forces. The Post for its part has never fully explained how it got so utterly wrong a story that was picked up by news organizations around the world, turning the unsuspecting Lynch into the best-known Army private of the war. However, as I point out in my latest book, Getting It Wrong, we know from one of the Post reporters on the Lynch story that the military wasn’t pushing the hero-warrior story. What, then, explains the persistence of the false narrative that military concocted the hero-warrior tale about Lynch? Part of the answer lies in a dim understanding about the military and its ways. Few Americans have much first-hand knowledge about the armed services and warfare. Such limited familiarity can lead to the embrace of flawed narratives and misleading caricatures. The Post’s erroneous account of Lynch as a female Rambo pouring lead into attacking Iraqis was cinematic — and more than vaguely reminiscent of scenes in the 1996 motion picture Courage Under Fire. The false narrative that the military concocted the Lynch tale has enabled the Post to dodge accountability for a botched story still oozes venom, suspicion, and misunderstanding. Many thanks to Instapundit Glenn Reynolds, and to smalldeadanimals.com and Blackfive.net, for linking to this post.